Microsoft collects data to operate effectively and provide you the best experiences. Participation is voluntary and when you choose to participate, your device automatically sends data to Microsoft about how you use the IoT DevKit. If you choose to participate, you can stop at any time as described here. If you are looking for disable the data collection for old installation package, please follow the steps in this document . Is the IoT DevKit Microsoft hardware? No. The hardware manufacturer is MXChip, an established player for IoT hardware. Through a partnership between MXChip and Microsoft, we rapidly iterated on the design and engineering of an Arduino compatible board with rich pre-installed sensors. Microsoft’s goal is to boost productivity for developers creating and prototyping IoT applications with awesome Visual Studio Code tooling that leverages the power of Microsoft Azure. Based on industry data and customer research, we believe Arduino has a powerful and active community among professional makers. We want to be part of this strong community rather than building something from scratch. Are you going to open-source the product? Yes, we open source the firmware, toolchains, and all samples. Also, the board itself will be open-source hardware. That means we will release all original hardware design files. Our plan is to do that as soon as we reach a stage where the entire framework is stable. Uninstall the IoT DevKit package, whatever in Arduino IDE or VS Code. If it’s still not work please contact us for support. Cannot connect to a Wi-Fi hotspot. This may be because the Wi-Fi network needs extra certification (other than WPA/WPA2) or open Wi-Fi requires a captive portal to log in such as Starbucks Wi-Fi. To resolve, try to use Wi-Fi with normal WPA/WPA2 authentication. Cannot connect to 5 GHz Wi-Fi. Currently, IoT DevKit only can connect to 2.4 GHz Wi-Fi, 5 GHz is not supported due to hardware restrictions. Cannot log in Azure as access token expired. Due to a previous Azure login, your access token may have expired. To fix, delete the web browser history that includes login data and run the command of Azure IoT Device Workbench: Provision Azure Services... again. Page hangs when log in Azure. This issue can occur if you have logged in multiple Azure subscriptions in the browser. To resolve the issue, please clear the browser’s cache and cookies. For more details please check I can’t sign in to manage my Azure subscription. Visual Studio Code cannot find Arduino IDE. 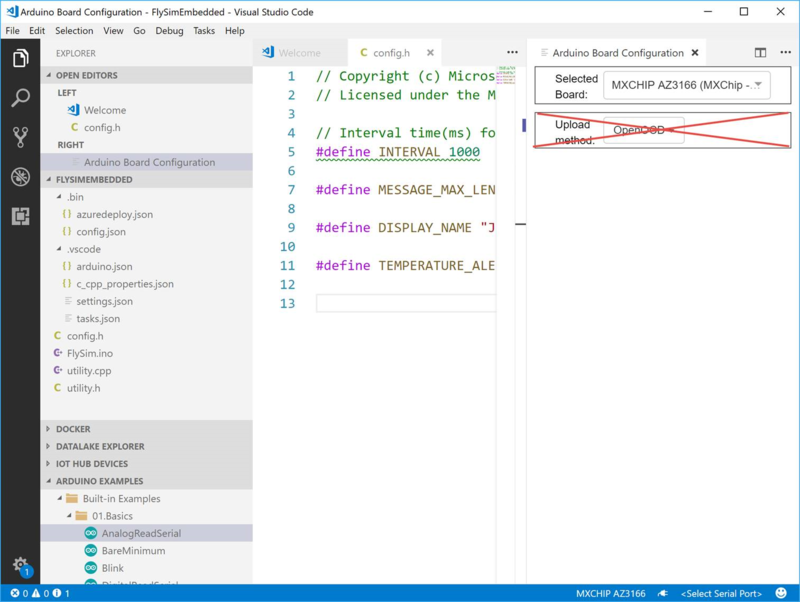 Occasionally, when you launch Visual Studio Code, you are prompted with an error message that it cannot find the Arduino IDE or related board package. To resolve, please install the latest version of Arduino IDE here. Then Open File > Preference > Settings and add following lines to set the configurations for Arduino. In certain environment, lots of warnings message pops up in the VS Code OUTPUT windows when you invoke Arduino Verify, Arduino Upload or task device-upload to compile the project. It is caused by the incorrect warning handling between Visual Studio Code Arduino extension and Arduino IDE. To solve this problem, the work around is to uninstall Arduino IDE from your local system and install the latest version of Arduino IDE. The error message is Error Presented: #include errors detected. Please update your includePath. This is because Arduino configuration for curret project is not set correctly. To solve this problem, in .vsode\arduino.json, replace "configuration": "upload_method=STLinkMethod" to "configuration": "upload_method=OpenOCDMethod". This may caused by the NTP traffic blocked by firewall in the Gateway. To solve this problem, make sure that UDP port 123 is open on all firewalls between IoT DevKit and the remote time servers.